Can i use any other type of fish? Yes sure you can Sami. Any type of fish will work insha Allah. Insha Allah Radiyah- When i get some chicken insha Allah I will see what i can come up with. sorry darling I saw some chicken that you already posted, wasalam. Is there something I can substitute the bisbass Ahmer with? Preferably something less spicy. How about some roasted sweet red peppers? Make sure you puree them. Or if you can find some red chilly that is not spicy ( mild) use those instead Insha Allah. Won’t be the same but it’s worth a try. I love your recipes. 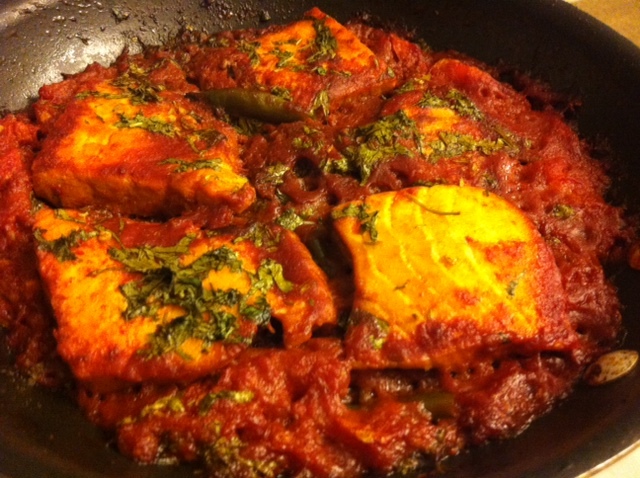 How much Bisbas Ahmar do you recommend for this recipe? I use three or four tablespoons. You can use more if you like. I want to try this recipe but if I don’t have fenugreek, what substitute I can use ? Thank you. I really love your website. You don’t have to add fenugreek. You can make it without it. It just adds some extra flavor. Salam… Will FENUGREEK powder work the same? No it won’t. But you can make it without it for sure. love it! thanks it turned out gooood. Salamu Aleykum sister I just had a question about your Mutafayyah, I have been told tamarind is traditionally used in the dish is this true and can it be used? Not in the mutafayah. That is in the Sanuna that we use the tamarind. Traditionally Mutafayah does not have tamarind in it.